I’m not usually one to agree with Telegraph columnists, but there was a great little opinion feature in the paper today which I thought made a very strong point around the argument of whether the UK should follow in France’s steps in banning the burka. If you’ve got 5mins spare, it’s worth a read… You can click through to the original article here, or alternatively I’ve copied the text below for ease. It’s a good article I thought and one worth sharing as it makes a strong point regarding the impact the burka must have on young women who have to wear them from an early school age. There is a mosque in the East Midlands, an impressive building, exuding a sort of muscular serenity. Almost next door, is a private girls’ secondary school, an offshoot of the mosque, where, from the age of 11, the niqab is a compulsory part of school uniform. Just across the street is an advice centre that offers rulings to the community on points of Islamic law. If you go to the centre’s website, as I did yesterday, and click on Women’s Issues you will find the Islamic equivalent of the Cathy and Claire problem page. Only instead of an agony aunt, we find a chap called Muhammad offering solutions to those tricky, girly dilemmas that keep us awake at night. Women Exposing Their Arms Whilst Driving – Should It Be Allowed? Are Tampons Permissible to Use Before Marriage? Can Women Travel Without a Male Relative? The Female Voice and Singing (is it OK to sing in front of men?) and – this has to be my absolute favourite – A Comprehensive Guide to Women’s Nakedness. For those of you scratching your head over the toast and marmalade, the answers are as follows: Women are most certainly not allowed to expose their arms while driving. Anything above and including the wrist is likely to inflame passing motorists so “Muslim sisters must not be careless in this regard and should wear long tight sleeves.” I’m afraid it’s a no to tampons before marriage for reasons too weird to go into. As for females moving around freely, “It is impermissible for a woman to travel the distance of three days (48 miles) without her husband or a male relative.” Meanwhile, singing, that most natural and joyous act of human expression, also falls into the dread category of temptation. “The charm in the voice of a female plays a vital role in provoking the sexual appetite of a man,” explains our guide. This goes some way to solving the cruel mystery of why, in certain primary schools, parents have insisted that Muslim children be excused from music lessons. A Muslim woman is allowed to dress like a British slapper in the home, if it pleases her husband, but if the intention is to imitate Kuffars – that’s creatures like you and me with our brazenly exposed wrists – then it’s forbidden. According to Mr Muhammad, if a Muslim woman starts copying the style of the country she lives in then she will soon be part of it – and we can’t have that, can we? No man is an island entire of itself, said the poet. A beautiful sentiment, but the women of this mosque and its girls’ academy seem to be instructed, quite specifically, to be an island, separated from the mainland where the rest of us live. How did we end up with a school in the East Midlands where the door opens to release the children into the spring sunshine and out flaps a flock of crows? Young girls my daughter’s age clad from head to toe in inky black, a sight both alien and intimidating. “It’s their own choice,” runs the argument, so it must be tolerated by our liberal society. Exactly what choice does an 11-year-old girl have when her designated school uniform is a magician’s black cloth that conceals her from the world and never brings her back? Think of the paranoia that shroud breeds not just in the child who wears it but also in those who look upon her and turn away in dislike. At what point does tolerating the intolerant become intolerable? The burka and the niqab should be banned in Britain. They are a barrier to integration, a statement of hostility to the host country. Poor women who have been brainwashed into hiding their faces are victims, not martyrs. 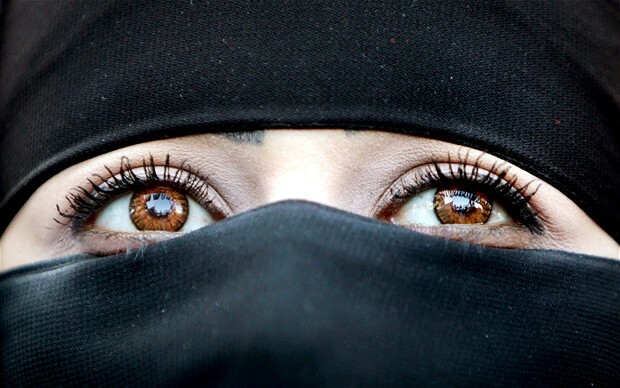 The burka is a not a sign of religion, but of subservience. When Atatürk outlawed the veil in Turkey in 1934 the result was a soaring rate of literacy among women and equality between the sexes was ushered in. How dare Muhammad the Agony Uncle and his kind, all enjoying the benefits of a modern democracy, presume to give such advice as: “A female is encouraged to remain within the confines of her home as much as possible. She should not come out of the home without need and necessity.” Not in our country, mate. The Islamist agony uncles and their imams should go somewhere where their musings on women will be more appreciated. Get on the A1, travel due south, gentlemen, and keep going for, oooh, about 1,000 years. I have a final question for Muhammad’s problem page. What kind of a God would give a girl a voice, then keep her in a cage and never let her sing? « Madonna the silent movie star? If its a blanket ban on any religious expression through clothing in the UK then yes we should ban the Burka/Niqab along with the lovely hats African ladies wear to church ‘as women should cover their heads in church out of respect for god’, the wigs orthodox jewish women wear on Stamford Hill high street as they should ‘only show their hair to their husbands’ etc. By deciding that its this one piece of clothing that must be banned to emancipate Muslim girls and women its clear that actually its about racism and intolerance towards one particular ethnic/religious group. Personally I’d love to see those women freed, but lets not pretend this law is anything other than a nasty piece of racist legislation designed to bolster Sarkozys ratings in a time of economic decline. Fairly similar to what happened to their neighbours in the 1930s when there was also a worldwide depression except then it was popular to pick on a different ethnic group. I’m hardly the right person to defend Islam, in fact I would happily see all religions banned for the troubles they cause, but without an even hand banning all of the stupid religious laws that denigrate women one has to look at why this particular law is being suggested at this particular time, and the answer is sadly intolerance. If they wanna walk around looking like beekeepers, let em! Hmmm….I’m inclined to side with France on this one (for probably the first time in my life). There is also the issue of ‘identification’. I have a friend who works on a mainline train route. This many be an exaggeration on his part, but he claims that most women travelling (with or without husband!) with their face covered, inevitably have a student discount card. He says it’s obvious from seeing the hands that the majority are not anywhere near the usual student age, but the train company would rather let it slide than cause a fuss. You have to question sometimes whether they are being worn for the additional benefits that can be garnered. Am not expert on the matter, but I thought – as the article states – that the wearing of the nikab / burka is not a religious statement, but more one of subjugation. I’m sure that a similar ban in the UK would aid the religious extremists. But they will always find something to pick up on and twist to their advantage. Whilst I’m on the subject. the inane comments yesterday by Vince Cable (useless man) that the Prime Minister should not discuss mass immigration for fear of provoking relgious extremism is absolutely absurd. If it were up to Vinceyboy, we wouldn’t say anything that provoked educated discussion. But hey…surely that’s the Lib Dem manifesto all over. But hey…I’m digressing….so time to sign off.